Confession: When it comes to artwork, this Chuck Close portrait tops my list of favorites. Yes, I've discussed my fervor for Frankenthaler and ardor for Matisse many a time, but I don't know if I've ever really expressed my keenness for Close. If you asked me to rank these artists, I'd have to kindly refuse. That would be like choosing a favorite child, and there's room in this heart for all kinds of art! You see, I was introduced to Chuck Close's work in college. My contemporary art history course was my absolute favorite -- it felt more like a guilty pleasure; an escape from countless other boring lectures. Did you have a class that made you feel this way? Anyways, I remember the afternoon this self-portrait was projected on a giant wall. Mr. Close's carefree mug was ginormous, and I was awestruck. I sat in the front row, smirked, and took copious notes about the artist. Why did I love this piece so much? It seemed so different than any other artwork I typically adored. I contemplated that very question for days. In fact, I remember immediately dialing my mom's number. She was that default person I'd turn to when I was eager to share what I'd learned in my art classes. I knew I could count on her to match my enthusiasm! As I discussed his work and emailed her an attachment of the self-portrait, it was clear that we weren't quite in-sync aesthetically, or at least this time around. That just seemed so odd! We always clicked when it came to art. I think my mom was more silent than anything else. She probably worried about my state-of-mind. A creepy man with a cigarette hanging out of this mouth? Really? This portrait was far different than any Fauvist painting filled with strong colors or any AbEx masterpiece characterized by emotional intensity. It wasn't very Type-A(shley). I'll admit that I was also befuddled by this atypical attraction. In this case, I'm glad my artistic journey veered a little to the left. It wasn't just about the magic of Chuck Close and the process in which he creates these masterpieces -- that could be a post entirely of its own! For me, the impact of this portrait is more introspective than anything else. I guess I craved this sort of juxtaposition in art and in life. As the severely predictable character that I can be, I admired the effortless cool and edginess that Close conveys. My love and appreciation for this piece gets stronger with age. It represents a quirkier side to me that people might be quick to overlook. And while I don't think I'll ever come off as chill as Chuck does here, there's more to me than being a conformist in a cardigan. It epitomizes a blithe attitude that we all should strive for and a lighthearted approach to life. There are those moments when you need to channel this sort of Close confidence. You know what I'm talking about -- a reminder to go on and approach the day like a boss... 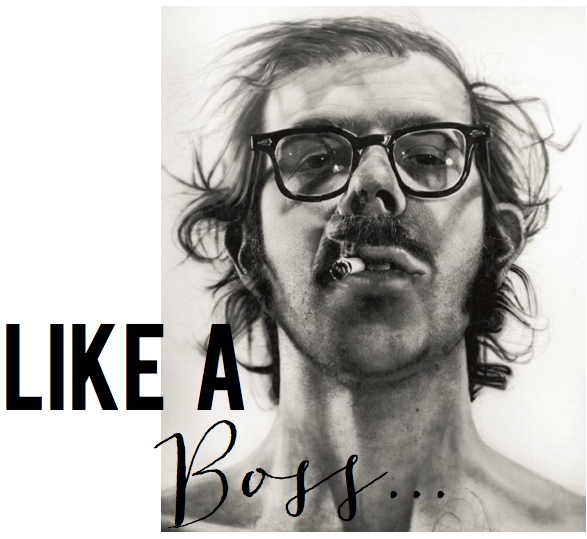 This image of Chuck Close epitomizes that quite perfectly. As sad as I am to admit it, I've yet to purchase a print of this portrait for my house. Not to worry, I can assure you I will at some point. Although, the Type-A(shley) side of me worries what friends and family might think. Terrible, isn't it? Oh, and heaven forbid we have children one day and this is displayed in the hallway or office. Can you even imagine? I suppose the tiny tots will just have to assume it's a creepy looking family member until they are old enough for me to explain my love for the portrait. I imagine I'll also have to include a "smoking is bad for you" speech as well. Yeesh, this is starting to get kind of hairy already. Perhaps I should start out with this t-shirt instead? I'm sure it would look fab layered under a cardi?! P.S. And for the record, my mom has grown to love Chuck Close immensely. After viewing several of his pieces firsthand and watching this documentary, she's hooked! I believe she will always shake her head and smile regarding my love for this portrait. I, myself, respond the same way. Definition of a BOSS!!!! I love this post, Ash:) As my anxiety mounts over getting a job here in Colorado I too look to this image as a reminder to just chill...*takes a fake drag off an invisible cig! I probably shouldn't do that in public haha:) Nick and I have this print in our gallery wall...people judge for sure but I guess you just have to tap into your inner honey badger:) Love you! what a striking portrait! Thanks for sharing about your love for art, very interesting!